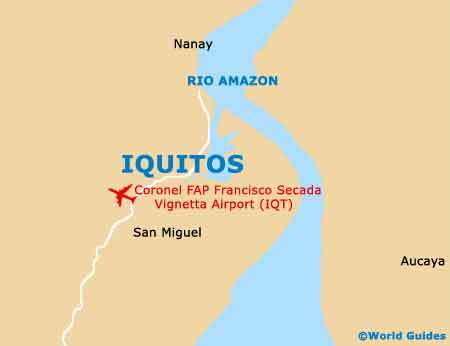 During the middle of the 18th century, Iquitos was founded and served as a mission for the Jesuits, with numerous impressive landmarks and monuments soon following. 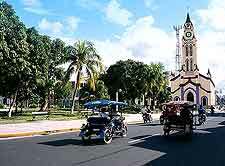 A central part of the local Iquitos, community, the Plaza de Armas has been a very important landmark for many years, lying just a block to the west of the Amazonian riverfront and the Malecon Maldonado. 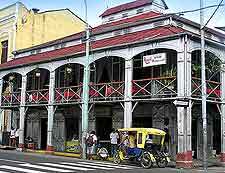 Towards the end of the 19th century, Iquitos had never experienced such wealth and opulence, and this was reflected when its rubber barons began to construct some magnificent colonial mansions. One landmark building with an especially interesting past is the Iron House (Casa de Fierro), which dates from the end of the 19th century. 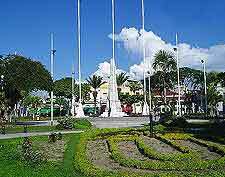 Everyone in the city seems to pass through this spacious public square, which spans no less than four blocks and forms the very heart of Iquitos. The centrepiece of the Plaza de Armas is a small, green park, where a dramatic fountain is to be found, spraying huge jets of water high into the sky, which are illuminated at night. Tourists regularly hang out around the Plaza de Armas, using the square as a meeting place, soaking up the atmosphere, or simply enjoying a little people watching. As evening approaches, the surrounding restaurants soon fill up and their tables spill out onto the pavements of the plaza itself. However, if you just fancy a quick bite, there are always plenty of street carts selling tasty hot snacks. This spectacular building dates back to 1860 and actually started its life in Paris, France, where it was designed and built by the exceedingly famous French architect, Gustave Eiffel, the man responsible for the erection of the Eiffel Tower. 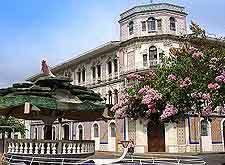 In 1890 and at the height of its rubber-boom days, the city of Iquitos purchased the building and imported it, section by section, being carried through the jungle and then reassembled on the south-easterly corner of the Plaza de Armas. The Casa de Fierro remains one of the most fascinating landmarks in Iquitos due to its rather special past, and although it may not be the most spectacular building you will ever see, it has a very special place in the city's history. Today, the Iron House has recently been restored and is now home to a restaurant, which resides on the first floor and makes full use of the spacious balcony and the subsequent plaza views. These impressive landmarks were designed to showcase the fortunes of affluent locals and are decorated both inside and out with expensive 'azulejos' painted tiles, which came all the way from Portugal. Although the rubber days of Iquitos have long gone, the colonial mansions with their colourful azulejos tiles remain as a monument to the past throughout the city centre, being clearly visible if you walk along the Malecon Maldonado, the Malecon Tarapaca, and the Raimondi.